Compare and contrast the historic cities of Budapest and Belgrade, Rousse and Bucharest on a seven-night cruise. Then disembark and travel to Bulgaria’s beautiful Black Sea coast for two-night stays in both Albena and Burgas, with included tours of historic Varna and Nessebar. Fly to Budapest where you embark Filia Rheni II. Enjoy a welcome drink and dinner on board. The ship remains moored here overnight. Enjoy exploring the many treasures of Budapest. An included city tour of Hungary’s capital reveals the highlights of this fascinating city divided by the Danube, including the UNESCO World Heritage-listed Buda Castle. A city of two halves – Buda and Pest – the Hungarian capital is a cosmopolitan, culture-rich centre. Buda is the older part, with cobbled streets and medieval architecture, while Pest is the administrative and commercial centre, with wide avenues and impressive 19th-century public buildings. The beautiful Parliament Building dominates the Pest waterfront. St Stephen’s Basilica is also in Pest, and home to a holy relic of St Stephen, the first king – his mummified right hand! The Fisherman’s Bastion has seven towers, each one symbolising one of the Magyar tribes that came to Hungary in 896, and from here you can enjoy superb city views. Heroes’ Square, flanked by the Palace of Fine Arts and the Palace of Art, is another of Hungary’s UNESCO World Heritage Sites. Later this evening your ship departs Budapest and cruises overnight to Kalocsa. Arrive before breakfast this morning in Vukovar, in eastern Croatia. This city has had a turbulent history with unrest occurring here until as late as the early 1990s. The city was under siege by the Yugoslav National Army for 87 days during the Croatian War of Independence (1991-1995). The Vukovar water tower, built in the sixties, was damaged during the battle and, to this day, still hasn't been restored. The shell damage and bullet holes that riddle this building serve as a reminder of the suffering that the city endured. An optional city tour is available. This afternoon cruise towards the Iron Gates gorge. 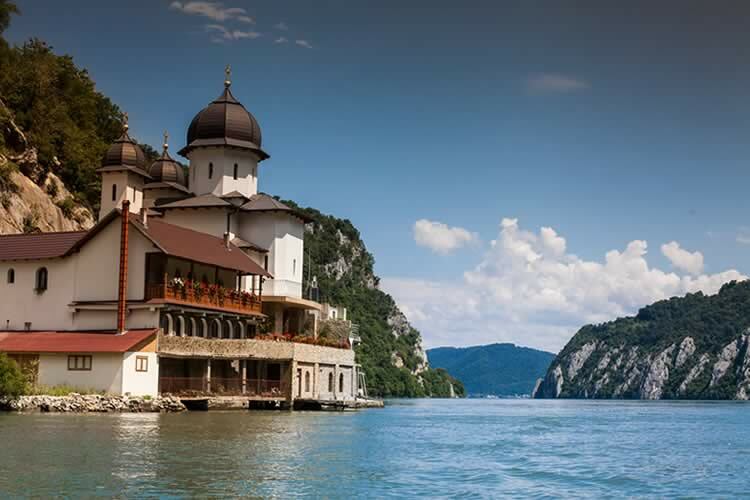 Spend the day on a leisurely journey along the waters of the Danube, passing through the Carpathians, and the foothills of the Balkans to the ‘Iron Gates’. This strikingly scenic stretch of river is framed on both sides by sheer cliffs that are dotted with frills of greenery, so make sure you're on the Upper Deck with your camera! In times past the Iron Gates was one of the most dangerous stretches of river in Europe. The riverbed rocks and low water levels combined to make this part of the river particularly treacherous for passing ships, but now a complex system of dams and locks ensures this is no longer the case. Your cruise continues this evening and overnight towards Rousse. Arrive in Rousse, in Bulgaria, after breakfast. The city has been nicknamed 'Little Vienna' due to its belle époque architecture. Enjoy an included city walk this morning. The city prospered from its location on the Danube, becoming Bulgaria’s main port so it’s home to many grand and beautiful buildings, a fine example of which is the Building of the Tax Administration with its elaborate facade. Your ship sets off again during lunch, heading overnight to St George. Arrive in the Black Sea port of St George after breakfast. The port is close to the wildlife-rich Danube Delta, a UNESCO Biosphere Reserve where the channels and islands support a fascinating variety of flora and fauna. This morning, you might like to join an optional excursion aboard a smaller ship. Filia Rheni II sets off again at lunchtime and cruises towards the Bulgarian port of Silistra overnight. Arrive in Silistra mid-morning. Disembark Filia Rheni II for your transfer to Varna, for a two-night stay on a half-board basis at the locally rated 4-star Swiss-Belhotel Dimyat Varna (4Q). This modern hotel has a main restaurant, a Mediterranean-style restaurant with terrace (extra charge) a lobby bar and a spa with an indoor pool (treatments at extra charge) Wi-Fi is available in public areas. All 74 guest rooms have individually controlled air-conditioning, cable television with satellite channels, a telephone, safety deposit box, minibar and tea and coffee-making facilities. The hotel is set opposite the Sea Garden, a lovely stretch of parkland along the Black Sea coast, where locals and visitors alike enjoy strolling along tree-lined avenues, a short walk from the city centre. Once you’ve settled in, you might like to head out and explore your new surroundings before dinner in the hotel tonight. This morning, enjoy an included tour of Varna, the largest city on the Black Sea coast. Once one of the most important ports trading centres on the Black Sea it’s still referred to as the ‘Sea Capital’ of Bulgaria. Highlights include the cathedral, the impressive Roman baths, a selection of museums and a large park where locals and visitors alike can stroll or visit the planetarium or aquarium. Enjoy an included visit to the fascinating Retro Museum, where Bulgaria’s socialist era has been lovingly recreated. To a background of Bulgarian music of the period you can view displays of artefacts of the time – 1944 to 1989 – from cars to waxwork images of famous people to everyday household items. Afterwards, return to your hotel with the rest of the day at leisure to relax or explore further before dinner. Check out of your hotel after breakfast and board your coach for Burgas. En route you’ll stop off at Nessebar which you can discover on an included tour. Virtually an island, the walled old town on a man-made rocky peninsular is linked to the new town on the mainland by just a narrow isthmus or strip of land. Explore the narrow lanes and discover remains of Roman and Middle Age forts, the many Byzantine churches, and wooden houses from the National Revival period of the 18th and 19th centuries. Afterwards, continue your transfer to Burgas, where you’ll stay for two nights at the locally rated 5-star Grand Hotel & Spa Primoretz (4Q), on a half-board basis. The luxurious hotel has an enviable location, set right on the beach of the Black Sea and just a short stroll from the pretty port and the centre of Burgas. It has two restaurants, one allowing for al fresco dining, a lounge bar, lobby bar and a piano bar with evening entertainment, plus a huge outdoor pool, another inside and a luxurious spa. There is complimentary Wi-Fi throughout the hotel. The spacious, air-conditioned rooms, each have cable television, telephone and hairdryer, while guests have free use of the saunas, steam bath, salt bath and relaxation zone in the 6th Sense Spa, which also offers tropical rain showers, Niagara bathtubs, mud and seaweed baths, all for an extra charge. You have the rest of the day to settle in and perhaps do a little local exploring… Dinner is included at the hotel this evening. Today is at leisure. Perhaps go exploring the fourth largest city in Bulgaria. Wander through the streets window-shopping or head to the beach front to discover the bars, cafes and casinos. Stroll through Marine Park, a scenic walking route along the coast where you might see art installations, live music and other events. Or venture further afield to Lake Pomorie and treat yourself to a therapeutic mudbath! After breakfast, travel to the airport for your return flight to the UK.! Optional travel insurance or a discount of £50 if not required†.